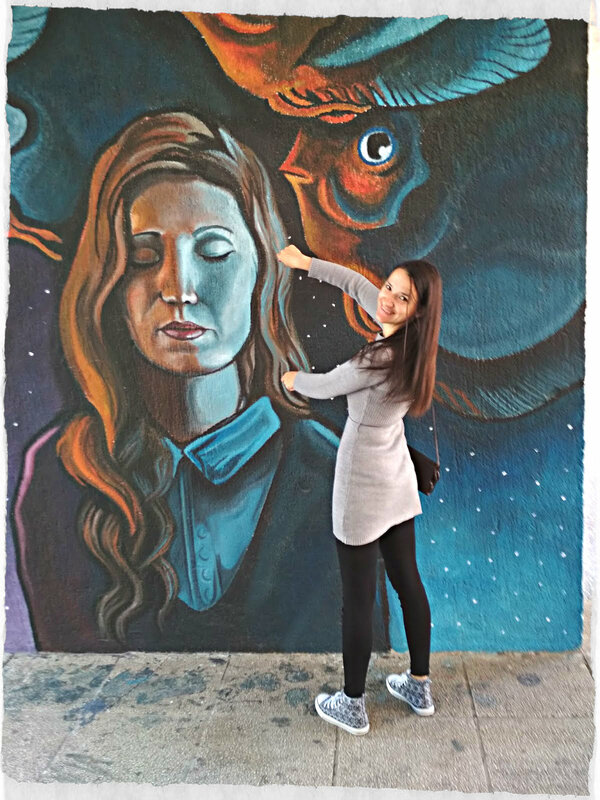 I'm a big fan of street art, so when I spotted these lovely murals, we just had to stop and take a few photographs. Do you like street art? 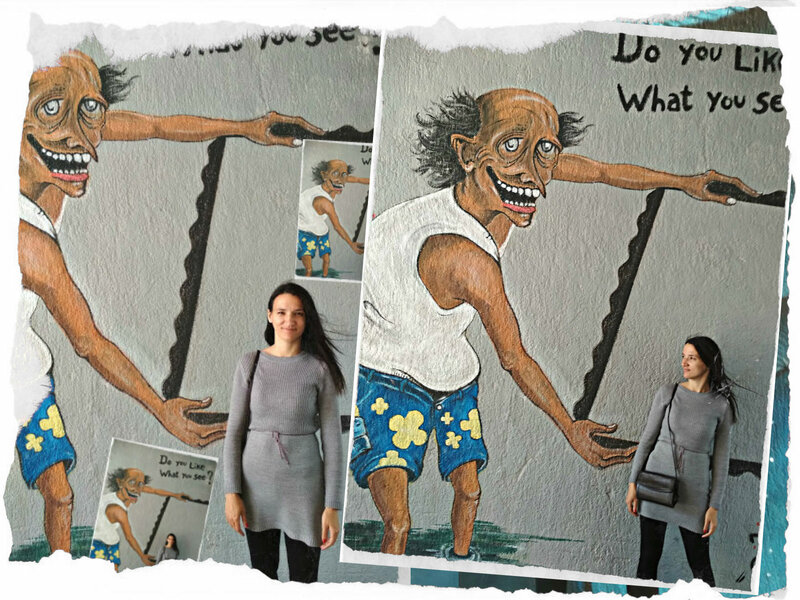 Do you want to see Mostar's murals? Well, if you do, you have certainly came to a right place. 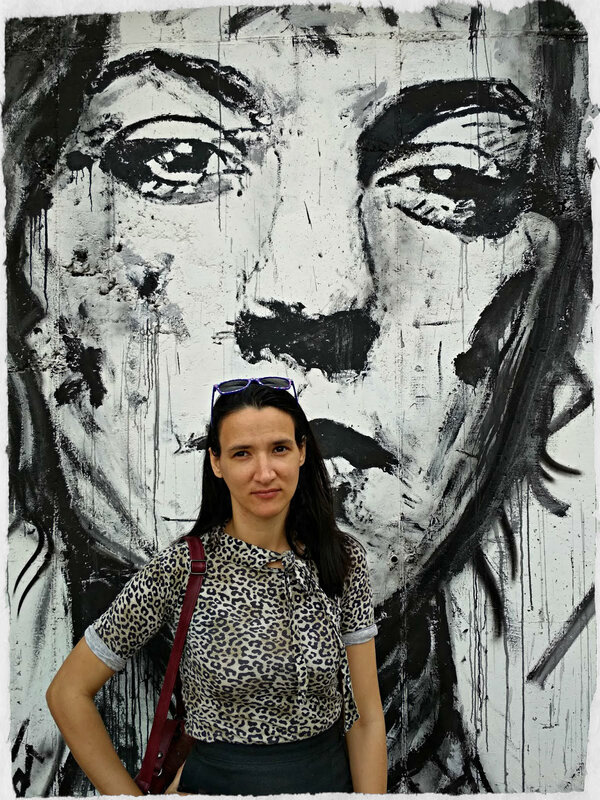 Moreover, if you want, you can also check out my old posts featuring Mostar street art here , here , here and here. 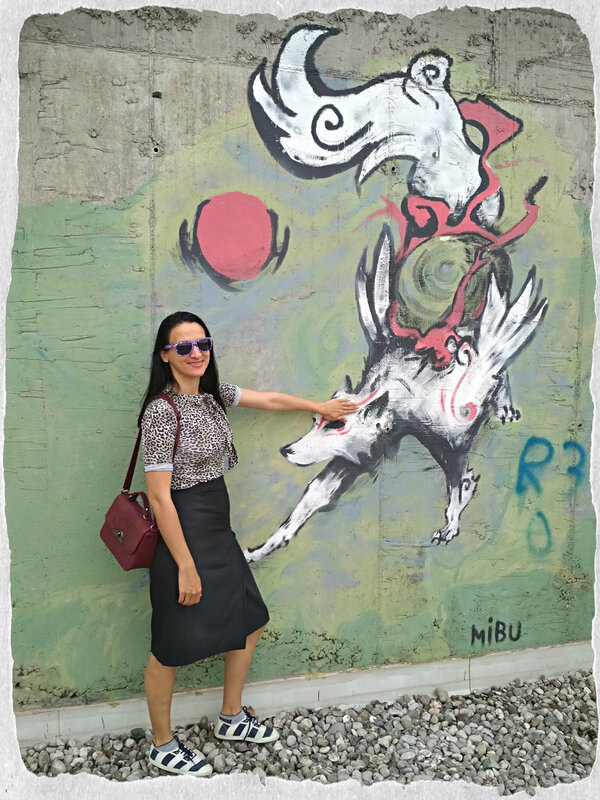 So, I had already blogged about Mostar's street art four times! I guess this city has some pretty cool street art and I love showcasing it. Does that mean that I like to pretend I'm a tourist guide? Perhaps it does. Last Summer while I was showing one girl around Mostar, I also showed her a lot of street air and she really loved it. She said this was the beautiful city in this region she had visited so far, and she had visited plenty. Anyway, I do like showing Mostar around. Maybe it is my way of embracing be a tourist in your own city movement? I do believe that no matter how small or big our the city or village we happen to live in, there is always something new to be discovered, as long as we keep our eyes and our hearts open. Today I would also like to speak a bit about sustainability in fashion. I'm sure you have all heard about it. It's basically a philosophy that aims to make fashion more sustainable and ecologically friendly. There are many things you can do if you want to adopt a more sustainable approach to fashion. One of them is wearing vintage clothes. The other is taking good care of your clothes. You can't shop your closet efficiently, if you don't know how to care for your garments properly. I pride myself on taking good care of my clothes. My shoes get worn out quickly because I do tend to take walks that last forever, but a lot of my clothing items look brand new despite the fact I had them for years and wear them often. I like to take special care of vintage pieces, because there is only as much vintage items left in the world, if you know what I mean. 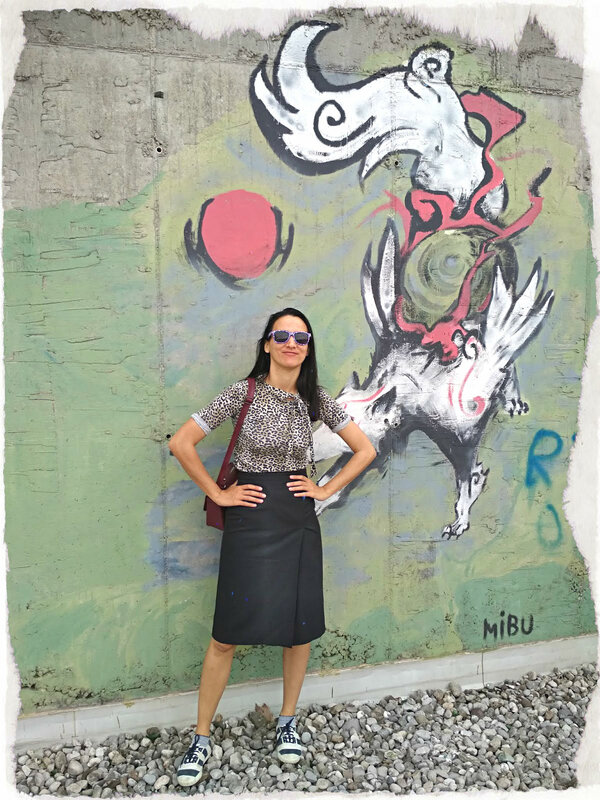 This black midi skirt is a vintage piece. I absolutely love its length and cut. I decided to challenge myself a bit and style it in a casual way. While I was creating this post, a question came to my mind. How To Dress Casual But Still Look Feminine? I've decided to share two casual but feminine outfits with you today to show that you can dress for comfort but still feel like a woman. I love mixing styles and while androgynous style has its benefits, I do gravitate more toward feminine clothing. Achieving femininity and not compromising of comfort is actually not that hard. Casual style is very open to other influences, and you can bring tons of feminine elements into it. Whatever makes you feel feminine will cut it. After all, it is all about how we feel right? My casual but girly formula is pretty simple: I pair dresses or skirts with sneakers. It is interesting how much difference a pair of shoes can make. If you wear casual shoes such as sneakers, your outfit automatically becomes more feminine. Dresses and sneakers have been my go to combination this Spring and it is something I plan to wear all Summer long. You know, I think that street art is one of most democratic art forms out there. Anyone can admire it. It also makes for a great background for photography and us fashion bloggers are always in need for that. That might be one of the reasons why I took the photographs I'm about to show to you. This outfit you can see below is something I wore about a month ago, before I had cut my hair, but it is something I still wear when it gets a bit fresh early in the morning or late in the evening. Leggings and a dress is such a simple combination, but it works like a charm. I wore a very similar outfit two years ago (here). I've started sneakers more often lately, and I like it. My significant other is also happy because he is a fan casual dressing. I've even reached for my jogging sneakers, seeing how dad sneakers are so in and all that. My sneakers usually outlive my other pair of shoes, but perhaps now that I've started to wear sneakers more often, my other pairs of shoes will last me longer? Anyway, I quite like how this outfit turned out. How about you? Do you like what you see? Still, if I had to pick a favourite from these two outfits, it would have to be the leopard print blouse and vintage black skirt outfit. I had this leopard print blouse for ages, bought it in Terranova for something like two euros and I still wear it frequently. I do love animal print. Right now, my personal style is all over the place. Just when I though I had it figured it, that it was all about vibrant colours and patterns, I started gravitating towards a more neutral palette. Go figure. What about your personal style? Is it something that is still evolving or have you found a style that works best for you? Tell me, do you like the street art I've just shared with you? What is your favourite piece? I would have to go with the white fox, because it reminds me of Asian mythology, and that is certainly one fascinating subject. I do like all of them, because they are all unique in their way. If you've followed my blog for a while, you have probably noticed that when it comes to my personal art, I'm always trying new things. So, it is with art I love. When it comes to art, there are so many different styles I admire. What kind of art do you like? yes, street art does show the spirit of the time. Thanks! You bring up some great points, Ivana!! Sustainability is super important and I go through shoes quite a bit too. I'm glad it's not just me. Those murals are so fun. We have a bunch here in Denver, and they show such creativity!! thank you Jodie. I would love to see murals in Denver. 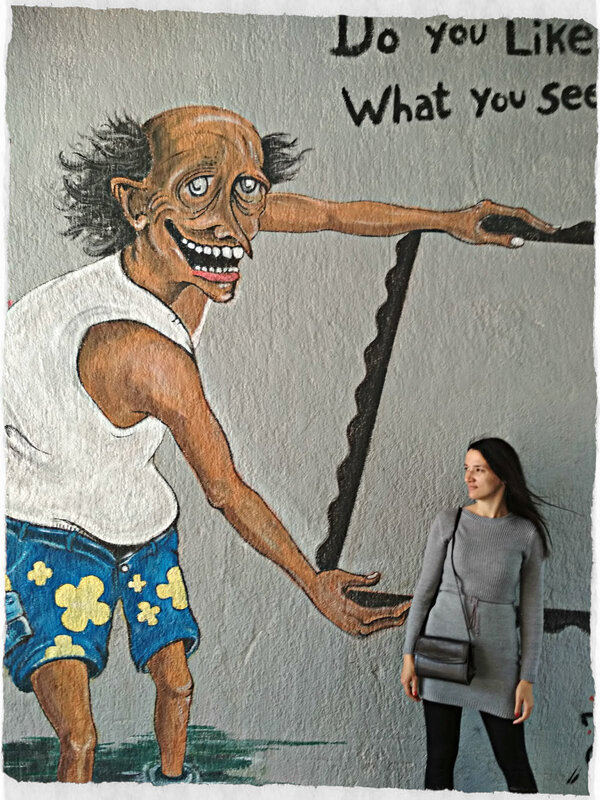 Davero molto belli questi murales e mipiacciono molto i tuoi look Ivana! You are very right about sustainability. It is all very well buying second hand and vintage but if you treat it roughly and then chuck it out, it isn't being sustainable! People often talk about a fast-fashion shop, Primark , that we have in the UK as being throwaway fashion, but I have pieces from there which I have had for at least a decade and they still look nice because I don't treat them like they are throwaway! The street art is brilliant! I like the 'You look nice' one!! I don't often wear trainers but I do wear my Toms espadrille-type shoes and I like those to make an outfit more casual! thank you Kezzie. You're right, a brand isn't really fast fashion if we wear its pieces for years, it's more about how to approach fashion in general. you look superb my friend :D love all combo! Wow these looks are awesome!!! You really slay girl! I love street arts. They give a very creative sense as well as access to timeless ideas and experience. I love how you have styled your look. Loving the outfits in this one! I read the title and was a bit skeptical. but man you really pulled them both off, and somehow they fit into both genres of clothing. Loving the looks, they are gorgeous. Thank you Amy. Have a great weekend yourself. 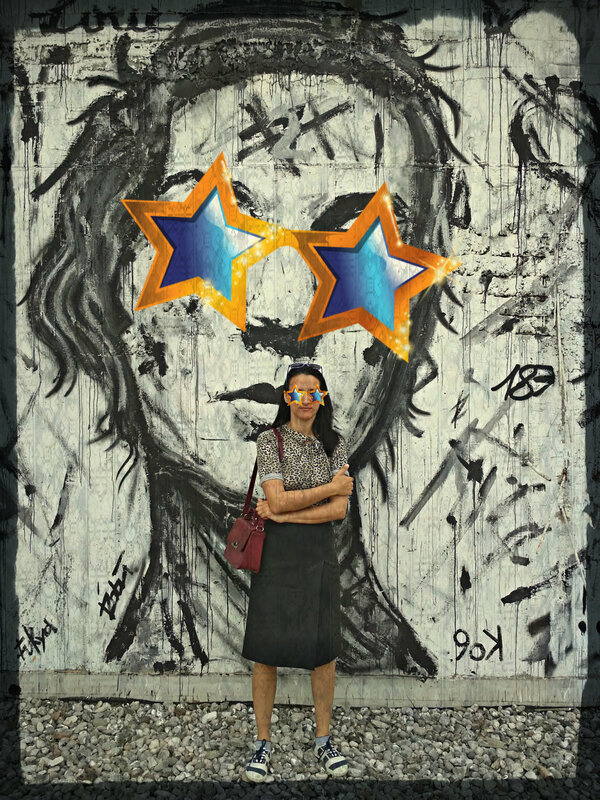 That street art, your poses, and the photography are all great! 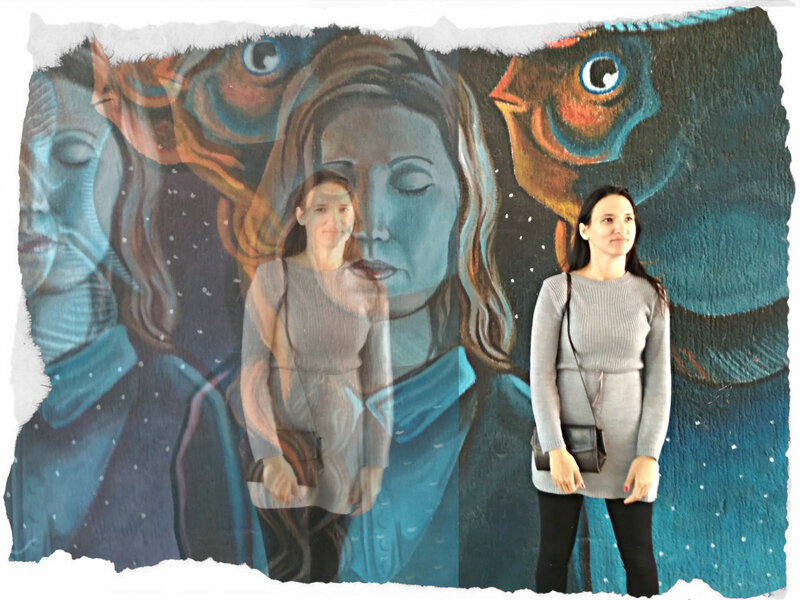 I love how you posed interacting with the murals and even used your photography to appear supernaturally merged with / appearing them! I really love the look of dresses and skirts styled with sneakers. My favourite of the two outfits is the second one featuring the knit grey dress that you had previously worn in your post about Stribor's Forest. I also love the look of the vintage black skirt you styled in the first outfit. Thank you so much for writing such a thoughtful comment. I love street art as well! These are great finds! Such great murals! I really like both your outfits too, although the first one is my favourite! I've been trying to be gentler with how I wash my clothes as I've noticed I have some pieces that are ending up worn out rather quickly because I haven't been following the recommended wash instructions. Hope that you are having a wonderful weekend :) We had a birthday party yesterday so today is just relaxing and recovering from that, ha! Thank you Mica. I think we all made those mistakes, and sometimes we can confuse one type of fabric with another. Sometimes declarations says pure cotton while in fact it is mixed material so that can be confusing too. I sometimes have issues with my clothes when my husband does the laundry, I don't know why he just won't let me do it. I know he is trying to be helpful but I would just rather do it myself, because I think I know more about it. I've heard about sustainable fashion on various occassions and I am ashamed to admit I am not very good at it. My clothes are usually not very well taken care of. Today I was cleaning my wardrobe and got rid of many pieces which were just to damaged to give anyone anymore. I like your outfit with the skirt more as well, although the sneakers in the second one are cute! as long as you put the clothes into textile waste bins, they will be recycled so that's always good. Such a fun post! You should do more like this. I love your outfit! 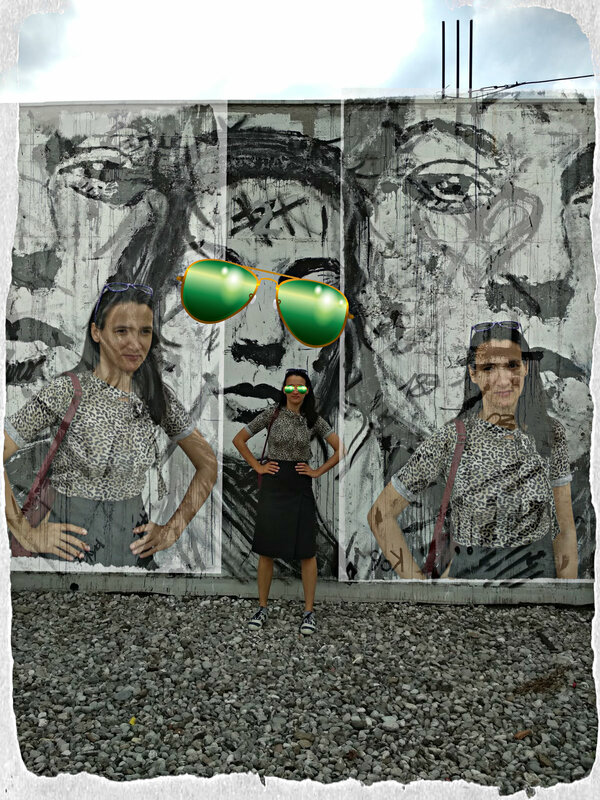 Ivana, you look wonderful wearing your feminine dresses and skirts with sneakers/keds! I was just thinking about a pair of high keds I wore back in the 1980s - I would wear them today, they were so fun with colorful design! I wear my keds or toms with dresses/skirts too. And I am a fan of murals, these are awesome! I love the faces, and the first one with a dog the best. I am with Kezzie on fast fashion brands - some of them do have decent quality, and if we treat them well, then we can wear them for years. But of course, nothing can bit vintage quality! both styles look great on you. i LOVE that you bying stuff on second hand shops - i love this kinds of fashion bying. this https://2.bp.blogspot.com/-KUswz68DBEM/WxrMsItY6RI/AAAAAAAAtbo/Vm4vJpf1Fi4xll7br1SkGEYT-8DtaPZjACLcBGAs/s1600/0mostarstreetart.jpg is by far my favorite pic: i love that style, your pose and smiling. you look so cute!! !